When a new Martin McDonagh play or film comes out, it’s always a huge delight. The twists and turns, the quirky characters and the brilliant dialogue are just some of the reasons that make his work so enjoyable. Also, you just never know what you’re going to get from his brilliance but you always know it’s going to be completely unique. His new film, Three Billboards Outside Ebbing, Missouri, that he wrote and directed, wonderfully encapsulates the above statement. Mildred (Frances McDormand) takes it upon herself to nudge Police Chief Willoughby (Woody Harrelson) into getting into gear and finally solving the murder of her daughter, which has been ongoing for over nine months now. She buys three billboards along a sparsely traveled road that asks, when will her death be solved? These billboards get the attention of the local news and that quickly makes her the town pariah, especially because Willoughby is fighting cancer, which has been a terribly held local secret. And one that she didn’t know. Deputy Dixon (Sam Rockwell), who’s never seemed to have a problem with the “enforcement” part of his job, is skating on thin ice in the department. And his only friend, his mama, is probably the worst person in the world to seek advice from. After the Willoughby’s death, things and people in Ebbing change, especially when Mildred and Dixon receive posthumous letter from the newly deceased Police Chief. 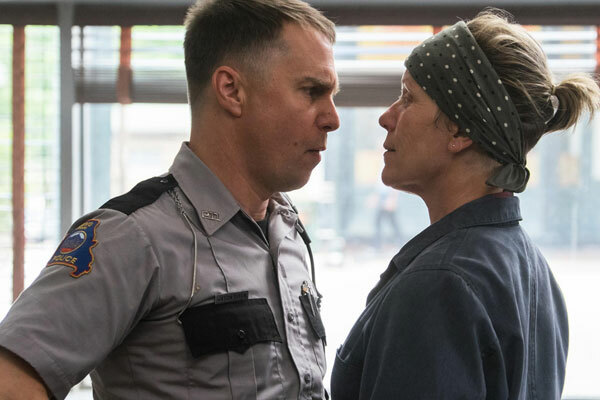 Rockwell and McDormand give two of the best performances of the year. Their characters aren’t people to be praised, though. Rockwell’s Dixon is a racist, mouthy, fly off the handle type guy. You’d be hard-pressed to find anything good about him. But it’s amazing what one spark of encouragement from Willoughby, a man he deeply admired, can does. McDormand’s Mildred is determined and no-nonsense and isn’t one for small talk. She’s hellbound to find out who killed her daughter and this is her Hail Mary and she’s not gonna give up easily. We understand her motivations but she’s not easily likable. McDormand excels in characters like this and Mildred is no different. They’re backed up by a fantastic supporting cast (Harrelson, Caleb Landry Jones, Zeljko Ivanek, Lucas Hedges, John Hawkes, Clarke Peters), each of whom knocks their respective roles out of the park. Case in point is Peter Dinklage, whose last scene in the film helps sum up Mildred in so many ways. Let’s face it, McDonagh could stick a bunch of actors from a local community theater to say his words and it would still be entertaining. But with this these terrific actors he’s assembled, this is easily one of the best movies of the year.